During the medieval and early modern periods the Welsh diocese of St Davids was one of the largest in the country and the most remote. As this collection makes clear, this combination of factors resulted in a religious life which was less regulated and controlled by the institutional forces of both Church and State. Addressing key ideas in the development of popular religious culture and the stubborn continuity of long-lasting religious practices into the modern era, the volume shows how the diocese was also a locus for continuing major religious controversies, especially in the nineteenth century. Presenting a fresh view of the Diocese of St Davids since the Reformation, this is the first new account of religion and society in over a century. It is, moreover, not one which is written primarily from an institutional perspective but from that of wider society. 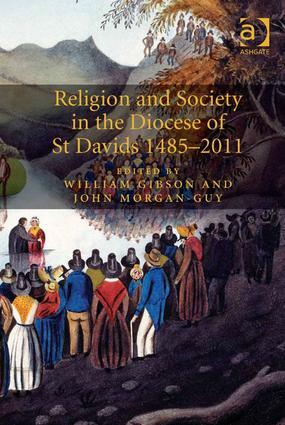 As well as a chronological treatment, giving an overview of the history of religion in the diocese, chapters address key themes, including a study of religious revivals which originated within the borders of the diocese; consideration of popular and elite education, including the contribution of Bishop Burgess's pioneering institution at Lampeter (the first degree awarding institution in England and Wales after Oxford and Cambridge); the relationship of the Church to the revival of Welsh cultural identity; and new reflections on the agitation and realisation of disestablishment of the Church as it affected Wales. As such, this pioneering study has much to offer all those with an interest, not only in Welsh history, but ecclesiastical history more broadly. "This edited collection is excellent, well introduced, and although there is no cumulative bibliography, it is well referenced throughout." "Overall, this volume is a long overdue contribution to discussions of British religious culture, and a vital step in improving our understanding of the contributions of regional cultures to the overall national picture. Many of the surviving primary sources used by the authors are in the Welsh language, and are therefore translated and presented to the wider academic community for the first time through the chapters of this volume." Contents: Foreword; Introduction: approaches to the history of religion in St Davids Diocese 1485-2011, William Gibson; The Diocese of St Davids in the Reformation era I: from rebellion to reaction, 1485-1553, John Morgan-Guy; The Diocese of St Davids in the Reformation era II: from reaction to Restoration: 1553-1660, John Morgan-Guy; Defending the faith: theology in the Diocese of St Davids, c. 1534-2000, Robert Pope; ’The most glorious enterprises have been achiev’d’: the Restoration Diocese of St Davids 1660-1730, William Gibson; Religious revivals in the 18th, 19th and 20th centuries, Eryn Mant White; Celebrating a saint on his home ground: St David’s Day in St Davids Diocese during the 19th century, Mike Benbough-Jackson; St Davids and disestablishment: reassessing the role of Bishop John Owen, Harri Williams; The modern Diocese of St Davids, William Price; Index. Professor William Gibson is Professor of Ecclesiastical History at Oxford Brookes University and Director of the Oxford Centre for Methodism and Church History. His most recent publications are The Church of England 1689-1832: Unity and Accord, (2001); The Enlightenment Prelate: Benjamin Hoadly 1676-1761, (2004); James II and the Trial of the Seven Bishops (2009) and the Oxford Handbook of the British Sermon 1689-1901 (2012) He has extensive experience of editorial work and managing collections of essays, including joint editorship of Religious Identities in Britain, 1660-1832, (with Robert Ingram, Ashgate, 2005); Politics, Religion and Dissent: 1660-1832, edited jointly with Robert Cornwall (Ashgate, 2010) and is book reviews editor for Archives, the journal of the British Records Association. He is co-editor of Wesley and Methodist Studies. He is a fellow of the Royal Historical Society and of the Royal Society of Arts. Dr John Morgan-Guy was from 2005-8 the Arts & Humanities Research Council Research Fellow in the department of Theology and Religious Studies at University of Wales, Lampeter (now University of Wales Trinity St David). He is currently a Lecturer in Theology and Church History in the same department, and an Honorary Research Fellow of the University. He is a Fellow of the Royal Historical Society and a Fellow of the Royal Society of Medicine. From 1999-2004 he was a Research Fellow at the University of Wales’ Centre for Advanced Welsh and Celtic Studies at Aberystwyth, collaborating with the art historian Peter Lord on the major research project ’The Visual Culture of Wales’. He is the author of numerous books and articles on ecclesiastical and medical history, and has contributed to publications in the field of visual culture.